Egyptian President Gamal Abdel Nasser declared on July 26, 1956 that he would nationalize the Suez Canal to raise funds for the planned Aswan dam. The canal had been co-owned by France and Great Britain since the late 1870s and served as a vital conduit for oil shipments to the West. The British and French governments were convinced that only the removal of Nasser and his replacement with a pro-western leader could defend their economic and political foothold in the Middle East. Since the Joint Chiefs of Staff (JCS) considered Nasser’s pan-Arabic nationalism a threat to westbound oil shipments and western military bases in the region, they advocated logistical, political and military support for Great Britain and France. However, President Dwight Eisenhower, who personally chartered and directed American policy, believed that Egypt had a legal right to exercise the right of eminent domain within its own territory. In an attempt keep good relations with Great Britain and France yet avoid pushing African nations into the Soviet sphere of influence, the United States supported the idea of international operation of the canal. However, once Israel attacked Egypt and a joint British-French operation seized the canal, the Eisenhower administration chose to dissociate itself from its NATO allies. Eisenhower gathered his closest advisers at the White House the day after Nasser announced his intention to nationalize the canal. The attendees agreed to dispatch Robert Murphy, the Deputy Under-Secretary of State for Political Affairs, to London to discuss the situation with the allies. Wishing to keep his options open, Eisenhower instructed Murphy to avoid any statements that might later tie the president’s hands. The president was against any ultimatum threatening the use of force against Egypt and consistently urged his European counterparts to avoid resorting to war until every peaceful means had been thoroughly explored and exhausted. Throughout negotiations to defuse the crises the United States advocated a solution that safeguarding the interests of those states dependent on the canal as well as recognizing Egypt’s legitimate rights. When Israel attacked Egypt on October 29, the United States was caught off guard. The open hostilities dealt a blow to Eisenhower’s efforts to preserve peace in the Middle East, hedge against Soviet influence in the region, and maintain the solidarity of NATO. Days later an Anglo-French task force occupied the canal. The United States was in a delicate position. Secretary of State John Foster Dulles’ principal concern was that American support of NATO partners would alienate North Africa’s newly independent states, pushing them to embrace the Soviet Union. The JCS, who argued that the nationalization of Suez endangered U.S. economic, military and political interests, were inclined to back their NATO partners. The course taken was to continue to support Egypt’s rights, as well as advocating for free international use of the canal. Immense pressure was put on London and Paris through U.S. efforts at the United Nations as well as State Department activities and Treasury Department threats. This aggravated the British and French, but the end of combat operations enabled the eventual negotiation of a permanent peace agreement. Notably, the Suez dispute coincided with Eisenhower’s efforts to earn a second term in the Oval Office, thus the president kept tight reins on crisis management. Eisenhower’s meticulous approach to strategy development, which concentrated all decision-making concerning Suez in his own hands, enabled a coherent, consistent approach to the crisis. The president also held frequent ad-hoc meetings with an intimate circle of advisers. However, a weakness of the U.S. approach was that while the JCS participated actively in strategy development at early stages of the conflict, the NSC monopolized the decision-making beginning in September. In addition, several experts question Dulles’ effectiveness as a Secretary of State during the Suez crisis, largely due to his propensity for fiery rhetoric, which may have misled the British into thinking that the United States would back their decision to attack Egypt. Henry Kissinger deplored Dulles’ approach, which reduced American peace initiatives to mere stalling tactics, angered the allies, and failed to prevent the war. Lastly, Eisenhower strengthened Nasser’s position by publicly disavowing the use of military force against Egypt. On April 24, 1957, Egypt submitted a unilateral declaration (registered as an international treaty under Article 102 of the United Nations Charter) to the U.N. Secretary General, pledging an uninterrupted navigation of the Suez Canal for all nations. In a manner, this satisfied some of Eisenhower’s objectives. However, the Eisenhower administration failed to achieve its goal of preserving amicable relations with Nasser. Also, some claim that Washington’s inconclusive posture in Suez encouraged the Soviet Union to entrench itself not just in the Middle East but also in Europe. 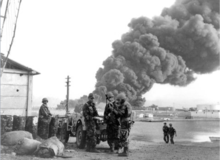 NATO also suffered from the fallout of the Suez Crisis, as France became convinced it could not rely on its allies and pulled back from involvement in the alliance. While the Suez crisis did not lead to a general war between the Soviet Union and the United States, it had immense impact on the nature of the Cold War. NATO suffered, Moscow was emboldened, and the Middle East fell into a Nasserite era that hurt the U.S. position there. For good and ill, the Suez crisis marked Washington’s full ascension into world leadership as Great Britain pulled back and the United States filled its place. This necessitated a new, multi-faceted strategy for dealing with the volatile Middle East. Thus, in January 1957, Congress approved the Eisenhower Doctrine, a Middle East program of economic aid, military assistance, and protection against communist aggression. The doctrine set the stage for Washington’s future military interventions in the region.